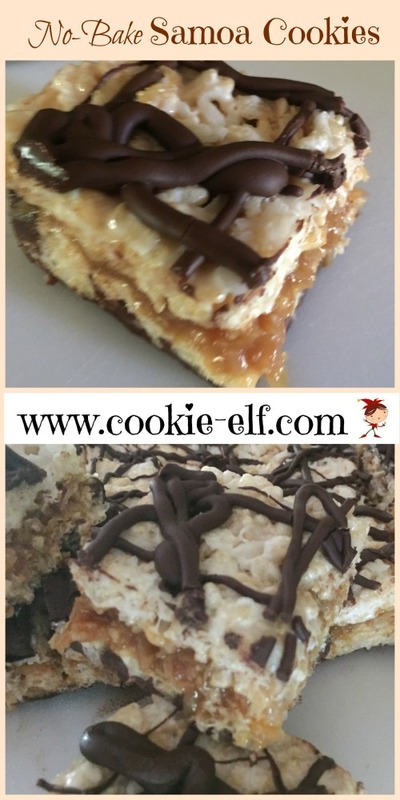 Easy No-Bake Samoa Cookies: Just 6 Ingredients! No-Bake Samoa Cookies are a knock off of the iconic Girl Scout Samoas, introduced in 1975 and second in popularity only to Thin Mints. How did these caramel-coated, coconut-sprinkled, chocolate-drizzled yumsters get their name? There are at least two theories. The first presumes the cookies are a namesake for the Polynesian island of Samoa. Its tropical climate ensures that coconut – one of the cookie’s ingredients that ensure its distinctive taste – is one of its top exports. Another theory taps into the colloquial “S’More,” an abbreviation for “give me some more of those yummy caramel-coconut-chocolate delights.” But you and I both know that “S’More” is already well-represented in Cookie-Dom, and in fact the Girl Scouts birthed their own S’More Cookie so the name was already taken. Line a 13 x 9 baking pan with aluminum foil or parchment paper. Let liner drape over ends of pan. Spray the liner with vegetable spray. Set aside. In a large mixing bowl, combine cereal and 1 cup coconut. Set aside. In a medium bowl, combine caramel sauce and 2 cups coconut. Set aside. Melt butter in a saucepan on the stovetop. Add marshmallows, stirring until mixture is completely melted. Pour marshmallow mixture into cereal mixture and stir until combined. Layer the bars: pour ¾ of the melted chocolate into the bottom of the pan. Spread the chocolate evenly with an angled spatula. Press half of the cereal mixture over the chocolate. Spread caramel-coconut mixture over the cereal. Press remaining cereal mixture over caramel. Drizzle remaining chocolate over cookie surface. Place baking pan in the refrigerator for 20-30 minutes to set. Lift ends of the liner from the pan and set bars on a cutting board. Use a long bread knife to cut bars into 2-inch squares. Use wet fingers to spread cereal mixture for best results. Press down each cereal mixture layer with the heel of your hand or a waxed paper-covered pound box of butter. Save mess when you pour extra melted chocolate into a Ziploc bag, cut off a corner, and drizzle chocolate. Get more easy no-bake cookie recipe ideas on our Pinterest board.